Attend the 71st annual Cannes Film Festival 2018 in style on board a luxury charter yacht. A key event not to be missed in the Mediterranean this season, it takes place May 8-19 and offers the chance to see A-list celebrities and to be seen at some of the most glamorous parties of the year. 1. Siren Enjoy some down time in Cannes on board Siren, which boasts a movie theatre, a vast and contemporary main saloon with dining area, an owner's office and an elegant skylounge. She can sleep up to 12 guests in six cabins. Up on deck she has a helipad, a capacious sundeck with a lounge area and a spa pool surrounded by sunpads, while a bar and al fresco dining can be found aft. Builder: Nobiskrug Delivered: 2008 Length: 73.5 metres Refit: 2013 Burgess manages Siren for charter, which has a weekly summer rate starting from €553,000 in the low season and €623,000 in the high season. 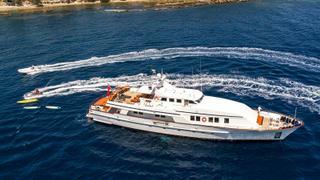 During winter, she has a weekly rate starting from €490,000 in the low season and €547,000 in the high season. Attend the 71st annual Cannes Film Festival 2018 in style on board a luxury charter yacht. A key event not to be missed in the Mediterranean this season, it takes place May 8-19 and offers the chance to see A-list celebrities and to be seen at some of the most glamorous parties of the year. Enjoy some down time in Cannes on board Siren, which boasts a movie theatre, a vast and contemporary main saloon with dining area, an owner's office and an elegant skylounge. She can sleep up to 12 guests in six cabins. Up on deck she has a helipad, a capacious sundeck with a lounge area and a spa pool surrounded by sunpads, while a bar and al fresco dining can be found aft. Burgess manages Siren for charter, which has a weekly summer rate starting from €553,000 in the low season and €623,000 in the high season. 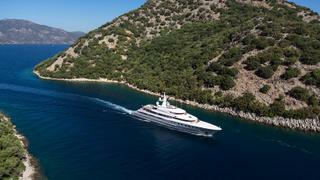 During winter, she has a weekly rate starting from €490,000 in the low season and €547,000 in the high season. After a long day of premieres head back to Legend to relax or to continue the party. She can sleep up to 26 guests in 13 cabins, looked after by a crew of 13, and boasts a Balinese spa with Jacuzzi, sauna, massage room, beauty salon, gymnasium and medical suite. Other below deck highlights include a cinema, a huge piano lounge with bar, freestanding fireplace and TV, a library, gargantuan dining room with a bar and an opulent private office. Above deck, guests can soak up the sun atop loungers on the helipad aft, take a dip in the swimming pool or enjoy an al fresco supper while looking out over Cannes. Builder: IHC Verschure / Icon Yachts Delivered: 1973 Length: 77.4 metres Refit: 2015 Legend is managed for charter by Camper & Nicholsons, with a summer rate starting from €460,000. After a long day of premieres head back to Legend to relax or to continue the party. She can sleep up to 26 guests in 13 cabins, looked after by a crew of 13, and boasts a Balinese spa with Jacuzzi, sauna, massage room, beauty salon, gymnasium and medical suite. Other below deck highlights include a cinema, a huge piano lounge with bar, freestanding fireplace and TV, a library, gargantuan dining room with a bar and an opulent private office. Above deck, guests can soak up the sun atop loungers on the helipad aft, take a dip in the swimming pool or enjoy an al fresco supper while looking out over Cannes. 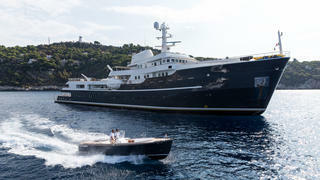 Legend is managed for charter by Camper & Nicholsons, with a summer rate starting from €460,000. Boasting wonderful outdoor spaces perfect for taking in the warm Mediterranean days and evenings, Lumiere's sundeck has a Jacuzzi, loungers, cocktail bar, al fresco TV lounge, dining area and treadmill. Additionally, her deck spaces feature further living and dining spaces. Below deck, her opulent main saloon has elegant white seating and a dining area, while guests can also enjoy the private office or cocktail/TV lounge. She can sleep up to 12 guests in six cabins, with accommodation for a crew of 11. Builder: Benetti Delivered: 1999 Length: 49.99 metre Refit: 2015 Fraser manages Lumiere for charter, which has a weekly rate starting from €175,000 in the summer season. Boasting wonderful outdoor spaces perfect for taking in the warm Mediterranean days and evenings, Lumiere's sundeck has a Jacuzzi, loungers, cocktail bar, al fresco TV lounge, dining area and treadmill. Additionally, her deck spaces feature further living and dining spaces. Below deck, her opulent main saloon has elegant white seating and a dining area, while guests can also enjoy the private office or cocktail/TV lounge. She can sleep up to 12 guests in six cabins, with accommodation for a crew of 11. Fraser manages Lumiere for charter, which has a weekly rate starting from €175,000 in the summer season. Coral Ocean's rustic interior, famously designed by Jon Bannenberg, features opulent woods against a palette of creams and rich golds. She can sleep up to 12 guests in six cabins, including a lavish owner's suite with panoramic views and a skylight. She boasts a gym and spa area, which also has a steam room, that leads out to her vast swimming platform. Her enormous main saloon has a vast cinema screen at one end and at the other, a wall that can open into a broad balcony facing out to sea – it's the perfect place for hosting star-studded parties at Cannes. Her seemingly endless amenities on deck include a swimming pool, large seated bar, umpteen sunbathing and lounge areas, as well as vast amounts of space for al fresco dining. Builder: Lürssen Delivered: 1994 Length: 72.6 metres Refit: 2016 Burgess manages Coral Ocean for charter and she has a weekly rate starting from €320,000 in the low season and €390,000 in the high season. Coral Ocean's rustic interior, famously designed by Jon Bannenberg, features opulent woods against a palette of creams and rich golds. She can sleep up to 12 guests in six cabins, including a lavish owner's suite with panoramic views and a skylight. She boasts a gym and spa area, which also has a steam room, that leads out to her vast swimming platform. Her enormous main saloon has a vast cinema screen at one end and at the other, a wall that can open into a broad balcony facing out to sea – it's the perfect place for hosting star-studded parties at Cannes. Her seemingly endless amenities on deck include a swimming pool, large seated bar, umpteen sunbathing and lounge areas, as well as vast amounts of space for al fresco dining. Burgess manages Coral Ocean for charter and she has a weekly rate starting from €320,000 in the low season and €390,000 in the high season. Cool and contemporary, the chic interior on board H features a sleek main saloon complete with dining table, lounge and bar, a small gym space and vast skylounge. H can sleep up to 10 guests in five cabins with a crew of eight. Over the bow guests can relax in the spa pool or atop sunpads, while further aft there is an al fresco bar and lounge, as well as two dining areas. She also boasts a fold-down beach club with a small bar area that can be set up with chairs and loungers. Builder: Benetti Delivered: 2015 Length: 42.6 metres Managed for charter by Northrop & Johnson, H has a weekly rate starting from $150,000. Cool and contemporary, the chic interior on board H features a sleek main saloon complete with dining table, lounge and bar, a small gym space and vast skylounge. H can sleep up to 10 guests in five cabins with a crew of eight. Over the bow guests can relax in the spa pool or atop sunpads, while further aft there is an al fresco bar and lounge, as well as two dining areas. She also boasts a fold-down beach club with a small bar area that can be set up with chairs and loungers. 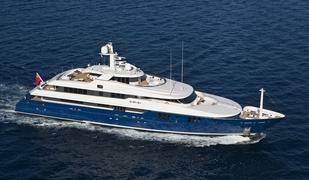 Managed for charter by Northrop & Johnson, H has a weekly rate starting from $150,000. A popular charter yacht, Axioma provides the ultimate sanctuary during the Cannes Film Festival. She can sleep up to 12 guests in six cabins with a crew of 20. Below deck, she features a 3D cinema, a mezzanine main saloon, formal dining room, gymnasium, massage and steam room. Her expansive decks boast a pool, Jacuzzi complete with swim-up bar, endless sunpads, sunbeds, al fresco dining areas and lounges, perfect for hosting your favourite VIPs during the festival. Builder: Dunya Yachts Delivered: 2013 Length: 72.5 metres YPI manages Axioma for charter, which has a weekly rate starting from €595,000 in the summer season. 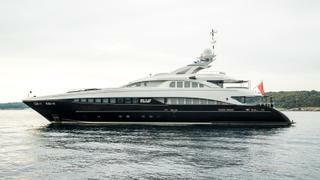 For the month of May, she will have a special rate of €299,000 per week. A popular charter yacht, Axioma provides the ultimate sanctuary during the Cannes Film Festival. She can sleep up to 12 guests in six cabins with a crew of 20. 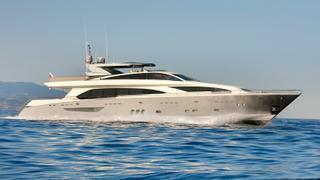 Below deck, she features a 3D cinema, a mezzanine main saloon, formal dining room, gymnasium, massage and steam room. Her expansive decks boast a pool, Jacuzzi complete with swim-up bar, endless sunpads, sunbeds, al fresco dining areas and lounges, perfect for hosting your favourite VIPs during the festival. 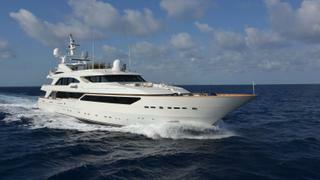 YPI manages Axioma for charter, which has a weekly rate starting from €595,000 in the summer season. 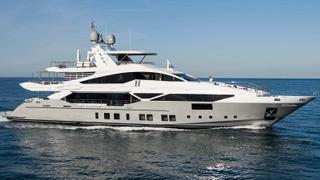 For the month of May, she will have a special rate of €299,000 per week. 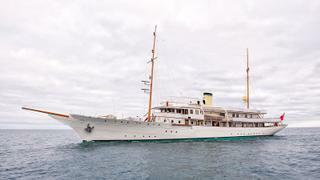 For a more traditional Cannes experience, opt for the recently refitted classic Haida 1929. Her new interiors are in keeping with the original style and feature a hammam, hair salon and massage room, as well as a piano lounge, TV snug and a beautiful main saloon with a fireplace. Up on deck, she has an al fresco lounge, dining area and sundeck swimming pool. Builder: Krupp Germaniawerft / Pendennis Delivered: 1929 Length: 71.1 metres Refit: 2018 Edmiston manages Haida 1929 for charter, with a low season weekly rate starting from €310,000 and a high season rate starting from €375,000. For a more traditional Cannes experience, opt for the recently refitted classic Haida 1929. Her new interiors are in keeping with the original style and feature a hammam, hair salon and massage room, as well as a piano lounge, TV snug and a beautiful main saloon with a fireplace. Up on deck, she has an al fresco lounge, dining area and sundeck swimming pool. Edmiston manages Haida 1929 for charter, with a low season weekly rate starting from €310,000 and a high season rate starting from €375,000. Boasting numerous social spaces, Sarah is the ultimate entertainment superyacht to host your Cannes Film Festival celebrations. Guests can enjoy a sumptuous feast in the dining room before heading to the games lounge or the vast main saloon. She can sleep up to 12 guests in nine cabins with a crew of 20. Out on deck, highlights include a large dining table and settee on the upper deck aft, a sundeck spa pool surrounded by sunpads with a bar and lounge aft and additional sunpads forward for sunbathing. Builder: Amels Delivered: 2002 Length: 62 metres Managed for charter by Ocean Independence, Sarah has a weekly rate starting from €325,000 in the low season and €350,000 in the high season. Boasting numerous social spaces, Sarah is the ultimate entertainment superyacht to host your Cannes Film Festival celebrations. Guests can enjoy a sumptuous feast in the dining room before heading to the games lounge or the vast main saloon. She can sleep up to 12 guests in nine cabins with a crew of 20. Out on deck, highlights include a large dining table and settee on the upper deck aft, a sundeck spa pool surrounded by sunpads with a bar and lounge aft and additional sunpads forward for sunbathing. Managed for charter by Ocean Independence, Sarah has a weekly rate starting from €325,000 in the low season and €350,000 in the high season. 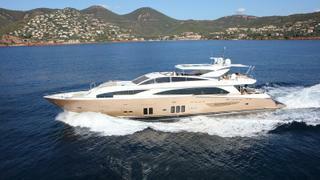 Sleek and sporty, the stunning rose gold-coloured hull on Mayama 37 is bound to turn heads in Cannes. Her bright and airy interior boasts a chic main saloon complete with lounge and dining areas as well as five cabins for up to 10 guests, with a crew of six. Up on the flybridge, guests can relax with a glass of Champagne atop sunpads or in the Jacuzzi before sipping a drink at the bar and tucking into an al fresco supper. An alternative dining spot can be found on the main deck aft, just forward of more sunpads and a generous swimming platform. Builder: Couach Yachts Delivered: 2010 Length: 37 metres Managed for charter by CSO Yachts, she has a weekly rate starting from €85,000 in the low season and €99,000 in the high season. Sleek and sporty, the stunning rose gold-coloured hull on Mayama 37 is bound to turn heads in Cannes. Her bright and airy interior boasts a chic main saloon complete with lounge and dining areas as well as five cabins for up to 10 guests, with a crew of six. Up on the flybridge, guests can relax with a glass of Champagne atop sunpads or in the Jacuzzi before sipping a drink at the bar and tucking into an al fresco supper. An alternative dining spot can be found on the main deck aft, just forward of more sunpads and a generous swimming platform. Managed for charter by CSO Yachts, she has a weekly rate starting from €85,000 in the low season and €99,000 in the high season. Boasting a monochromatic interior peppered with luxurious woods, Bliss is a beautiful and modern superyacht perfect for a sophisticated getaway to Cannes and the wider Mediterranean. Twelve guests can be accommodated in five elegant cabins and entertained in the metropolitan-style main saloon, complete with seating, bar, fireplace and dining area. Additionally, there is an office space and achingly cool skylounge. Her sundeck features an al fresco living area, sunpads, bar and spa pool, while aft guests can enjoy al fresco dining. Forward, there's a small seating area with a table. Builder: Heesen Delivered: 2007 Length: 44.17 metres Refit: 2013 Bliss is managed for charter by IYC and has a weekly summer rate starting from €140,000. Boasting a monochromatic interior peppered with luxurious woods, Bliss is a beautiful and modern superyacht perfect for a sophisticated getaway to Cannes and the wider Mediterranean. Twelve guests can be accommodated in five elegant cabins and entertained in the metropolitan-style main saloon, complete with seating, bar, fireplace and dining area. Additionally, there is an office space and achingly cool skylounge. Her sundeck features an al fresco living area, sunpads, bar and spa pool, while aft guests can enjoy al fresco dining. Forward, there's a small seating area with a table. 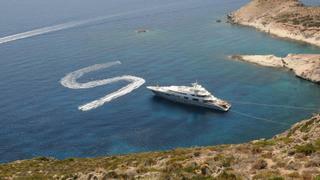 Bliss is managed for charter by IYC and has a weekly summer rate starting from €140,000. Cool and compact, Fiorente boasts a contemporary main saloon with a soft grey corner sofa, TV and dining area. Additionally, she has a dedicated TV lounge and study. She can sleep up to 10 guests in five cabins, catered to by a crew of six. Out on the main deck, guests can relax atop sunpads or enjoy an al fresco feast at the dining table. Moving to the sundeck, guests will find some gym equipment, loungers, a small breakfast table, while a viewing sofa can be found over the bow. Builder: Ferronavale Delivered: 1990 Length: 37 metres Refit: 2017 Fiorente is managed for charter by bluewater and has a weekly rate starting from €60,000. Cool and compact, Fiorente boasts a contemporary main saloon with a soft grey corner sofa, TV and dining area. Additionally, she has a dedicated TV lounge and study. She can sleep up to 10 guests in five cabins, catered to by a crew of six. Out on the main deck, guests can relax atop sunpads or enjoy an al fresco feast at the dining table. Moving to the sundeck, guests will find some gym equipment, loungers, a small breakfast table, while a viewing sofa can be found over the bow. 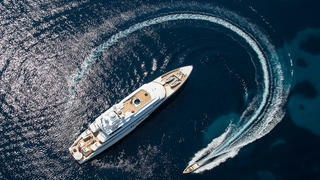 Fiorente is managed for charter by bluewater and has a weekly rate starting from €60,000. Soak up the Mediterranean sunshine on board Nyota, which features a spacious yet homey main saloon with vast windows, drinks bar, lounge and dining area. She can sleep up to nine guests in four cabins with a crew of five to cater to their every whim. The social hub on board is out on the flybridge, which boasts a bar, spa pool and dining table. A larger dining table and sunbeds can be found on the main deck aft while sunpads and a viewing bench can be found over the bow. Builder: Couach Yachts Delivered: 2008 Length: 37 metres G-Yachts manages Nyota for charter, which has a weekly rate starting from €85,000 in the low season and €95,000 in the high season. Soak up the Mediterranean sunshine on board Nyota, which features a spacious yet homey main saloon with vast windows, drinks bar, lounge and dining area. She can sleep up to nine guests in four cabins with a crew of five to cater to their every whim. The social hub on board is out on the flybridge, which boasts a bar, spa pool and dining table. A larger dining table and sunbeds can be found on the main deck aft while sunpads and a viewing bench can be found over the bow. G-Yachts manages Nyota for charter, which has a weekly rate starting from €85,000 in the low season and €95,000 in the high season.